Columbia, Mo. 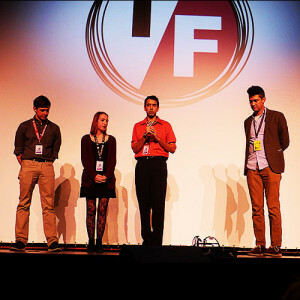 (March 11, 2016) — Missouri School of Journalism students Varun Bajaj, Adam Dietrich and Kellan Marvin premiered their short film “Concerned Student 1950” in front of an audience of True/False festival-goers in the Missouri Theatre. Original members of Concerned Student 1950 joined the directors on stage before the screening. Filmmaker Spike Lee was also in attendance for the showing. Documentary journalism students Varun Bajaj, Adam Dietrich and Kellan Marvin stand on the stage at the True/False Festival opening. Chris Boeckmann, a programmer of True/False, encouraged the students to make the film. Field of Vision, a documentary unit of the investigative reporting organization The Intercept, collaborated on the project. Although not originally scheduled to be screened at True/False, “Concerned Student 1950” became a last-minute addition after Field of Vision co-founders Laura Poitras, and Charlotte Cook as well as A.J. Schnack, BJ ’90, a Los Angeles-based nonfiction filmmaker and writer, urged festival programmers to show the film. Stacey Woelfel, director of the Jonathan B. Murray Center for Documentary Journalism at the School, believes the opportunity for Bajaj, Dietrich and Marvin to show their film at True/False served as an opportunity to launch their filmmaking careers. Jonathan Murray, BJ ’77, founder and executive consultant of Bunim/Murray Productions, gave a $6.7 million gift to the School in 2015 to create the Center. The goal is to provide innovative teaching, professional outreach and research programs at the School that will bring together talented students, faculty and professionals from around the world. “Aside from a very exciting weekend festival, it puts them out in front of other documentary filmmakers and festival programmers as three people who are learning this craft and producing work that people want to see,” Woelfel said. Woelfel and Murray Center Filmmaker-in-Chief Robert Greene are the film’s producers, giving Greene two films in the festival. His feature documentary “Kate Plays Christine” also showed through the weekend. Greene also served as an initial editor on the “Concerned Student 1950” film. Additionally, a Bajaj, Dietrich and Marvin created a silent piece called “#ConcernedStudent1950,” which screened at the True/False Great Wall installation during the festival.